Our Members-in-Good Standing also receive a rent-free use of the Lounge Hall once per year and the large Pavilion Hall once in a three year period for their personal parties or family events. 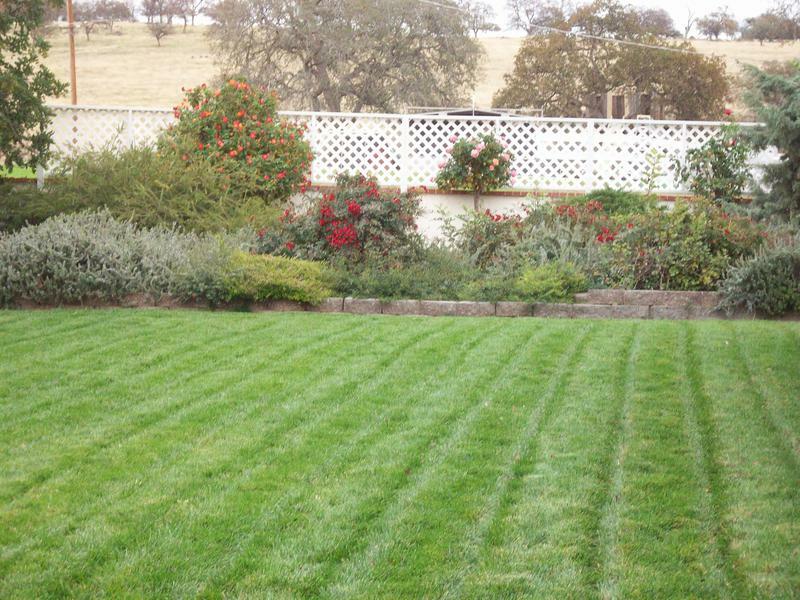 Additional uses may also be reserved by our owners at substantially discounted Member Rates. 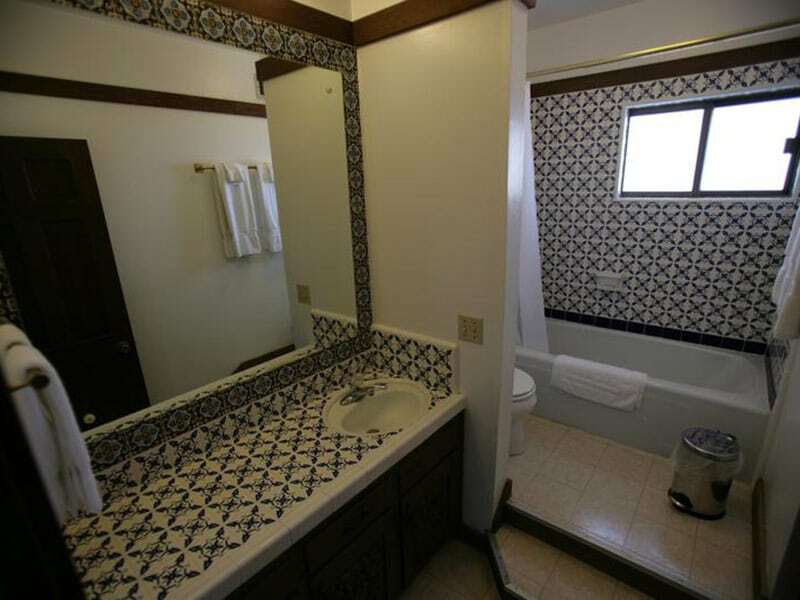 In addition, our owners receve discounted rental rates on the Hacienda’s two condo apartments. 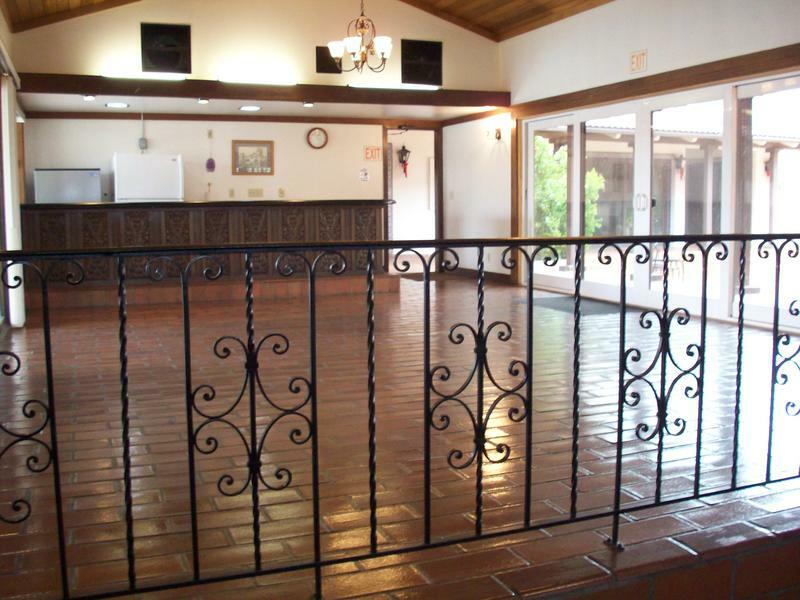 Great for visiting relatives or when holding large events at the Hacienda. 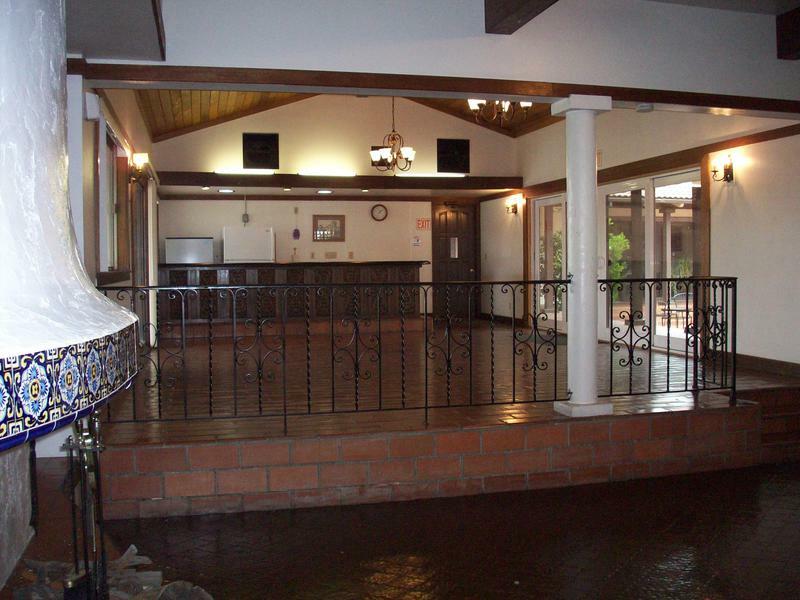 For your special event the Hacienda facility has two event halls and an event kitchen. 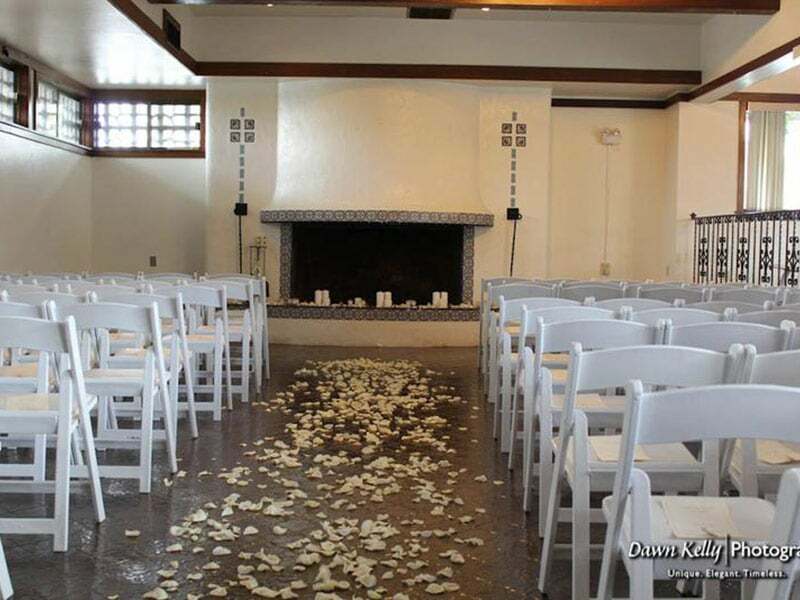 The spacious Pavilion Hall wth adjacent event lawn that has hosted events with seating up to 300+ and the smaller Lounge Hall with mission style tile, fireplace and bar area that opens out into the large tile courtyard with fountain. All are heated and air conditioned. 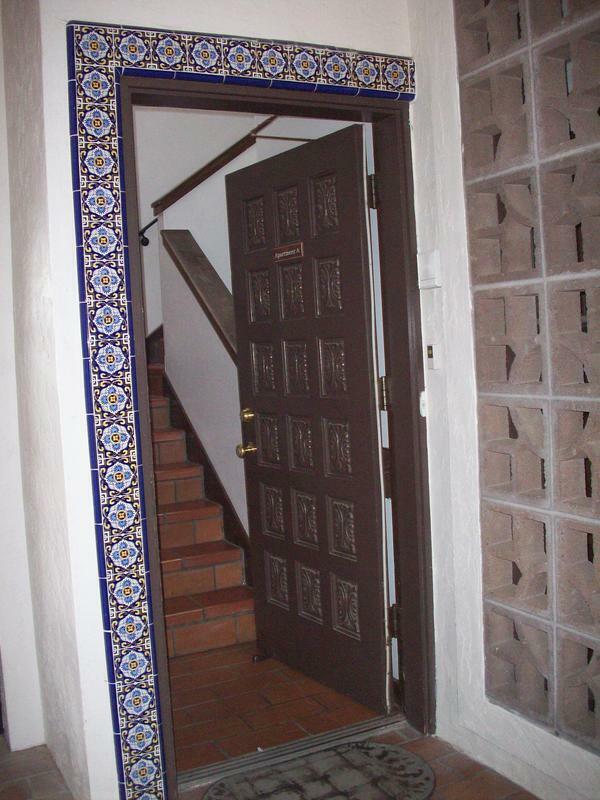 The Hacienda’s two condo-apartments are available for rent on a daily or weekly basis and include full kitchens. Just bring your own food and clothes. 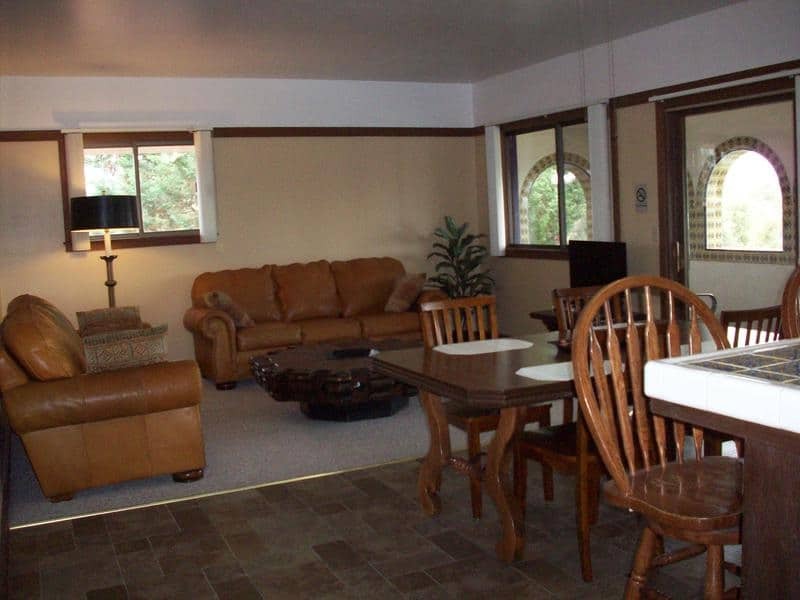 The larger Apt A is 3 bedrooms, 2 baths and sleeps 8. 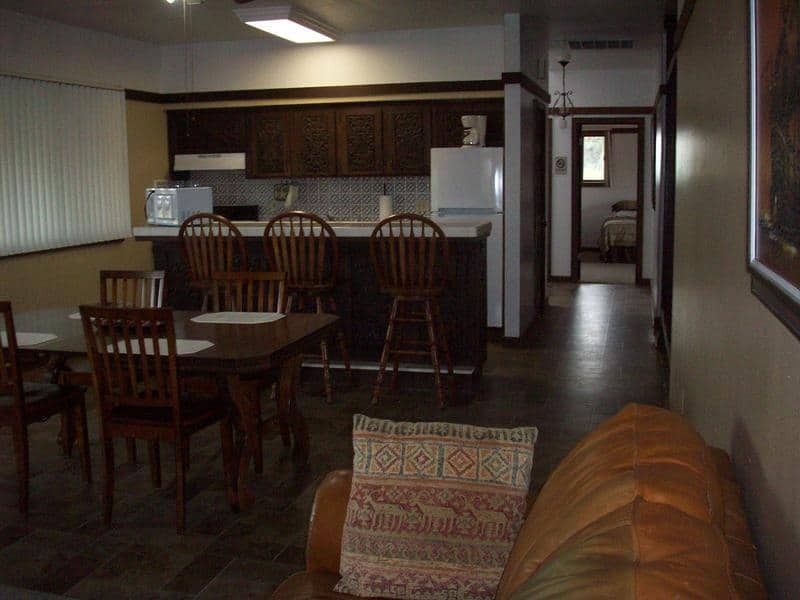 The smaller Apt B is 2 bedrooms, 1 bath and sleeps 6 (including sleeper sofa). 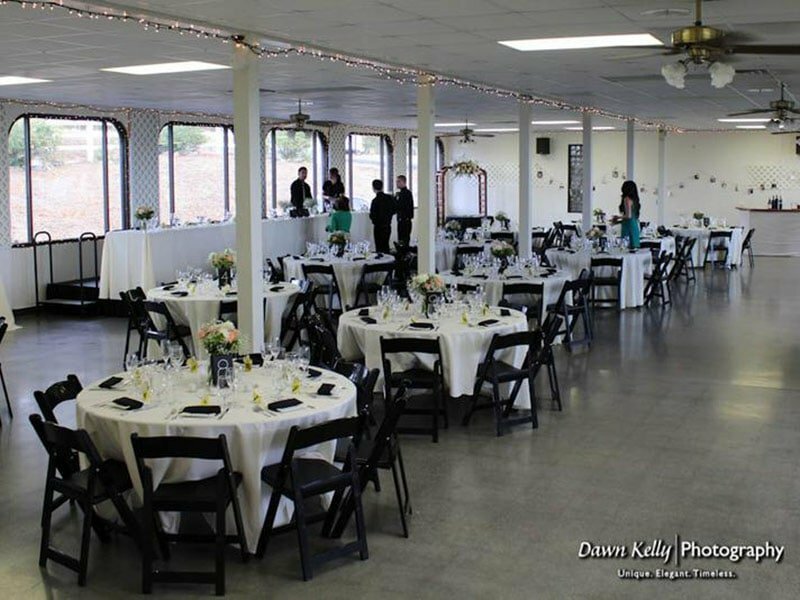 The Pavilion is our largest hall (43′ x 80′) that is great for events up to 300 people. 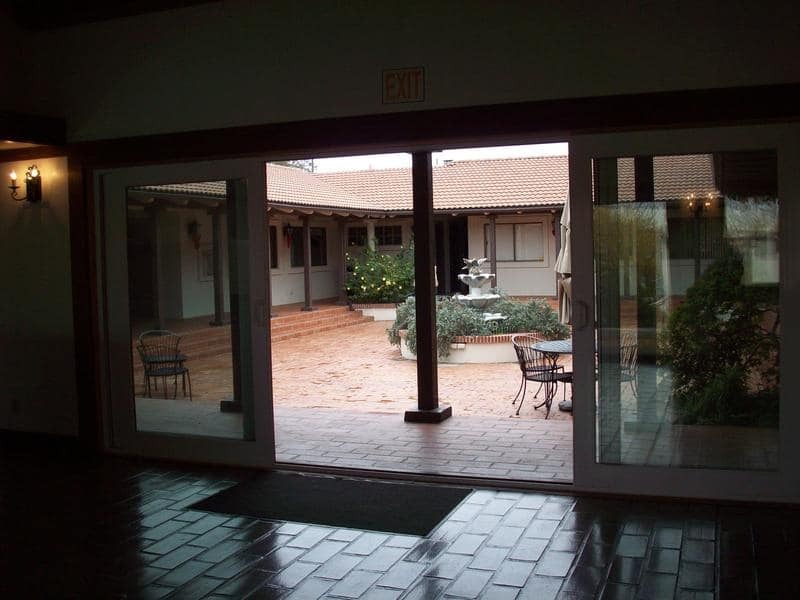 Large windows run along two walls letting in the sunlight and a view of the large Event Lawn. Bordered with hedges and roses with a fountain at one end, next to double doors into the Pavilion. Metal Folding Chairs (300). Stage risers – Six 4′ x 8′ movable sections that can be used separately or combined. Small portable wooden Bar. Access to a large ice maker (in Lounge). Podium available. 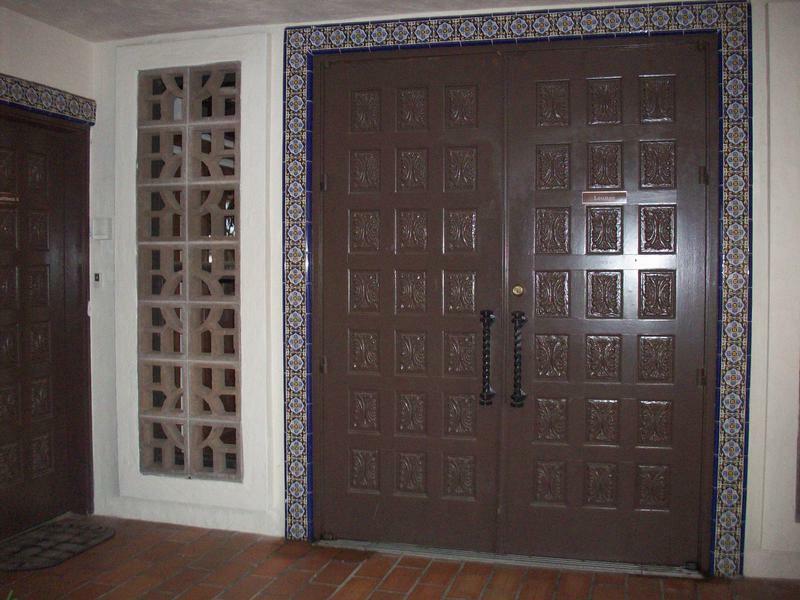 As you enter the building’s filigreed wrought iron entry gate to your left are the large Spanish mission style carved double doors that open into our Lounge Hall. 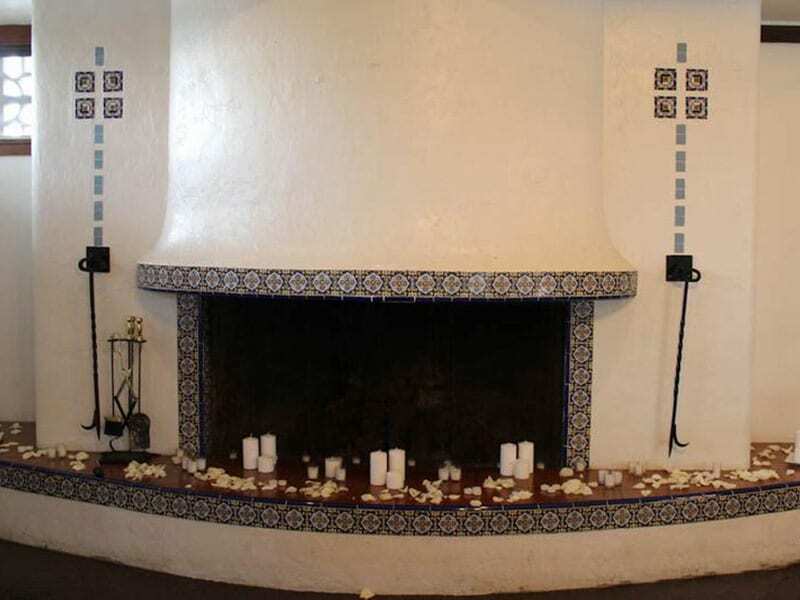 An “L” shaped hall, it initially steps down 3 steps into a lower floor with a mission style tiled fireplace at the far end. 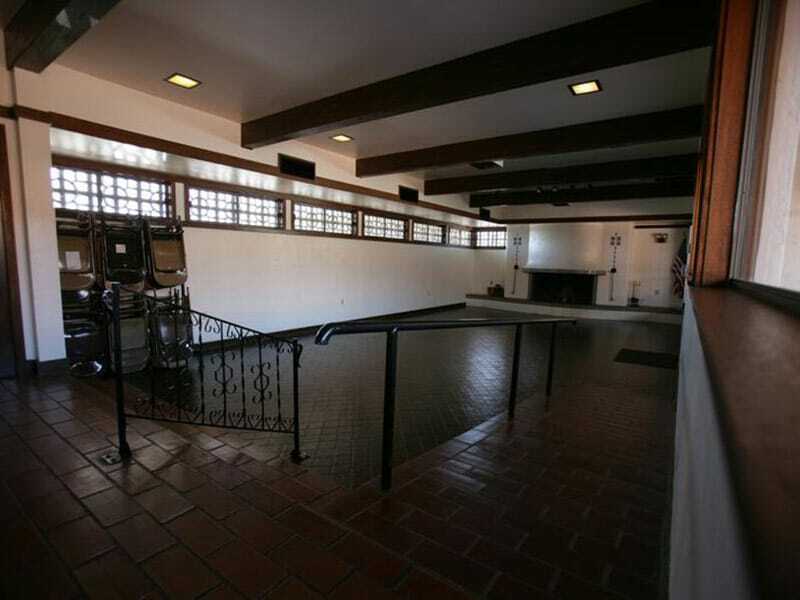 To the right of the fireplace, and up three steps past a wrought iron railing, is the upper floor where along one side large double glass doors open out onto a large tiled courtyard with a fountain in the middle. 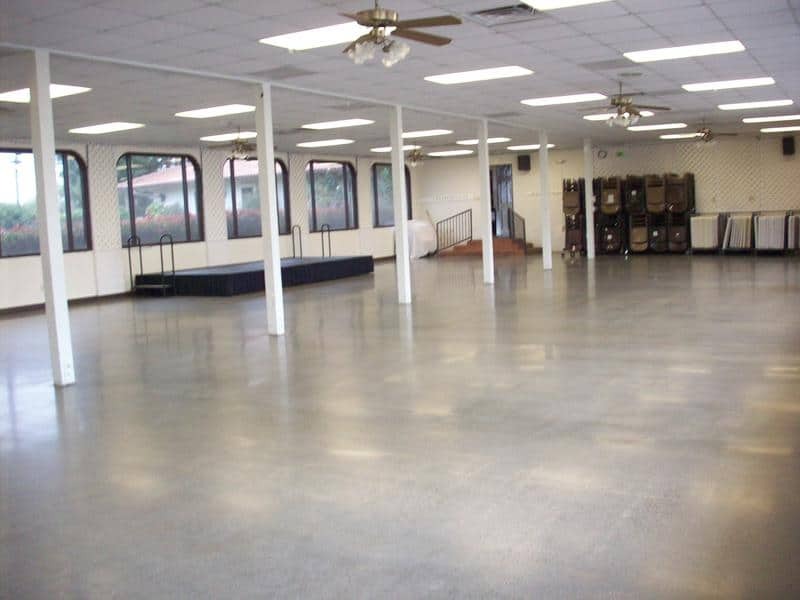 This 55’x38′ courtyard area may also be used. The Lounge upper section also includes a service & drinks bar equipped with a large ice maker, refrigerator, bar sink (liquids only) & microwave. 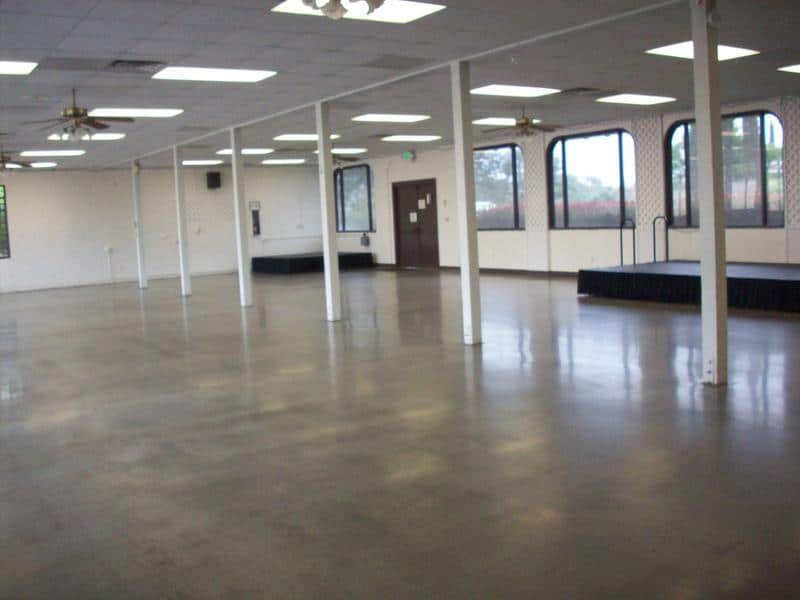 The overall dimensions of the Lounge hall are: Lower section 47’x21′, Upper section 32’x19′, and is rated up to 100 people. The commercial style kitchen sits adjacent to the courtyard and can be used with either rental hall. 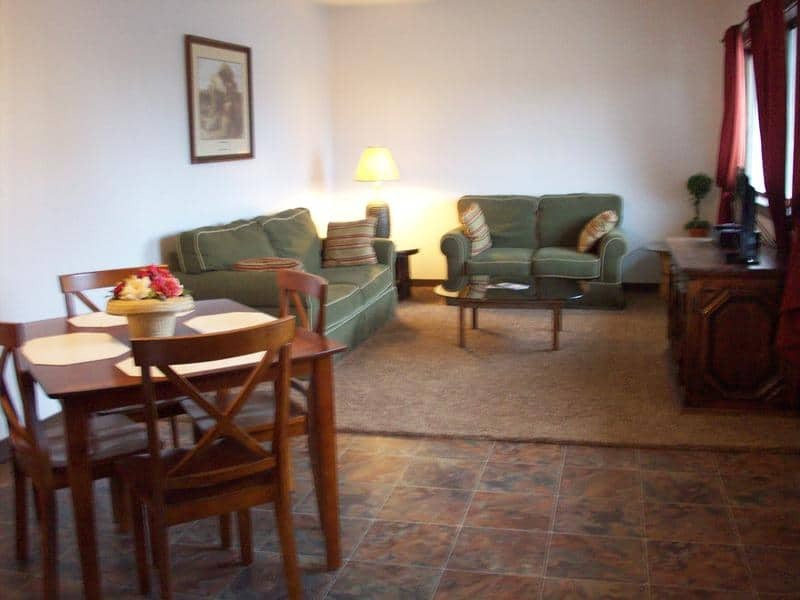 Living Room / Dining Room, a Fully Equipped Kitchen including dishes, flatware, pots and pans etc., a stove w/oven, refrigerator, also a dishwasher, microwave and a coffeemaker. 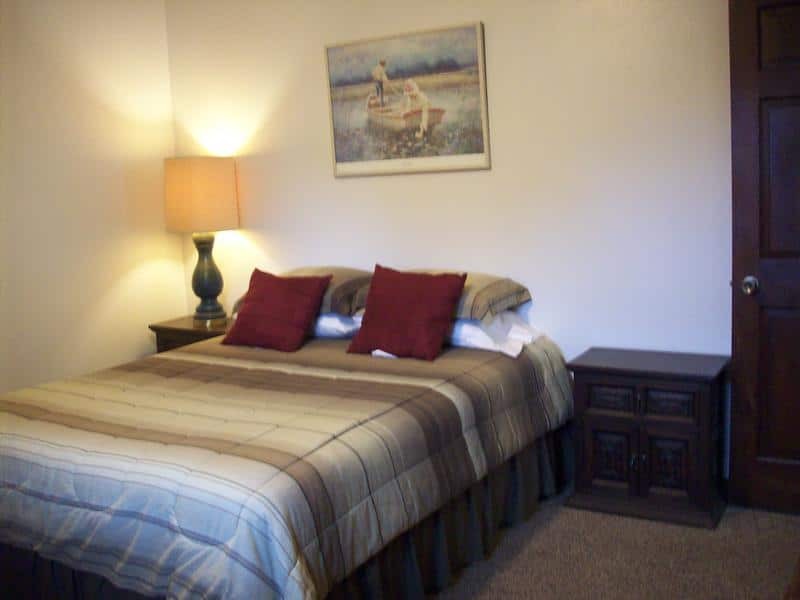 Towels and Linens are provided & Access to use of pool and rec area (in season). 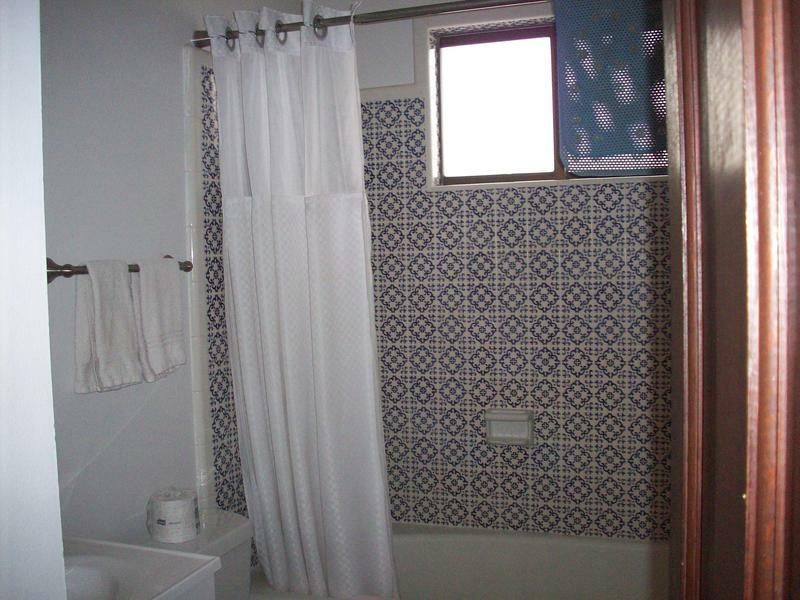 A three bedroom apartment on the upper floor. 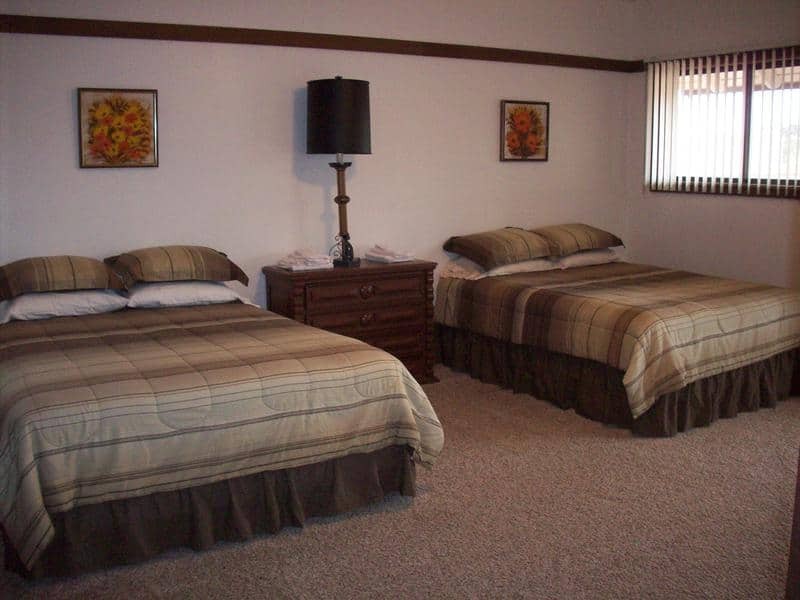 Two queen beds in the master bedroom. Queen bed in the second bedroom. 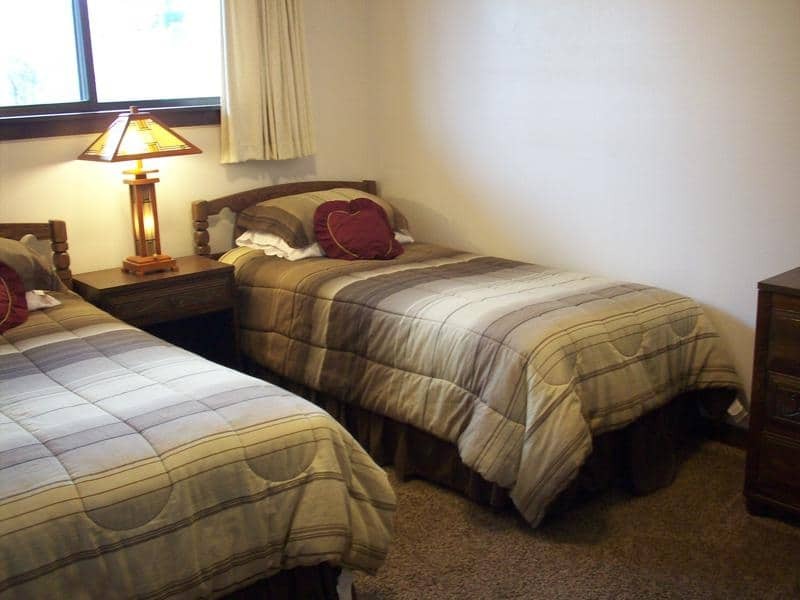 Two twin beds in the third bedroom. Front balcony overlooks the front lawn. 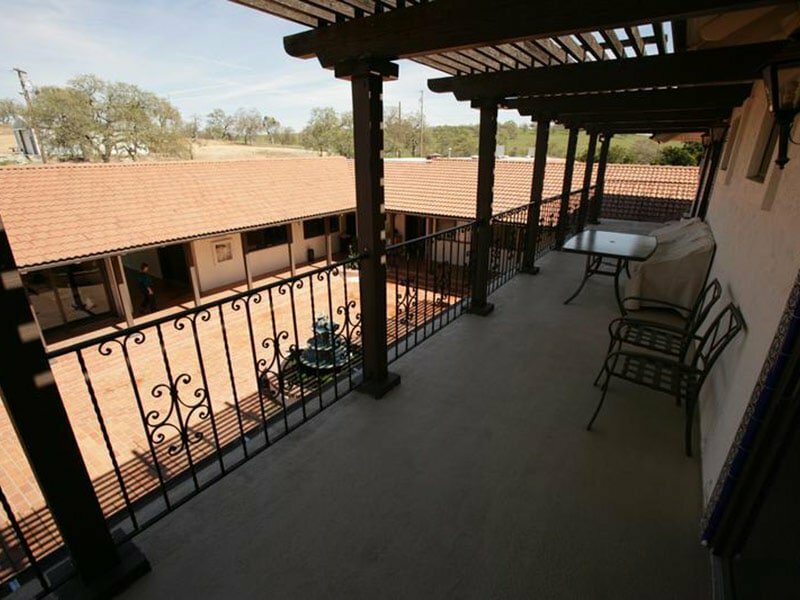 Back balcony overlooks the courtyard & fountain. 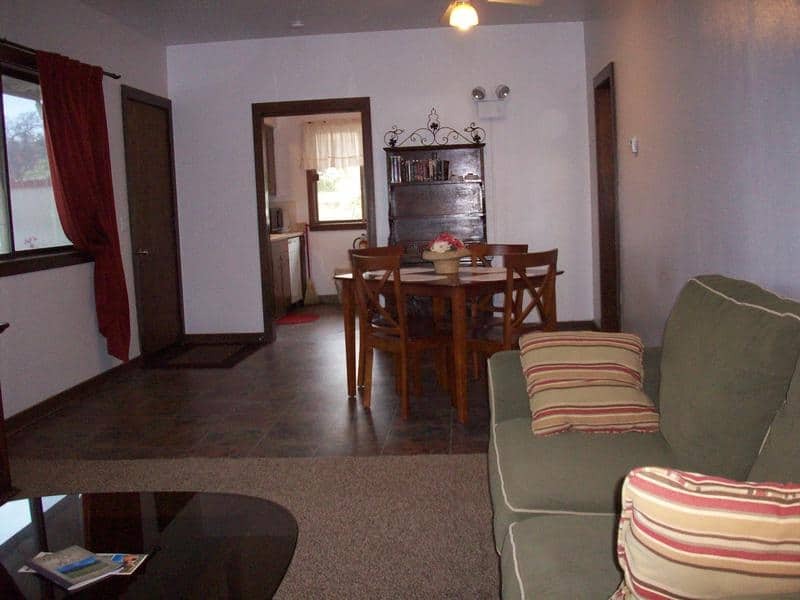 A two bedroom apartment on the ground floor. Queen bed in the master bedroom. 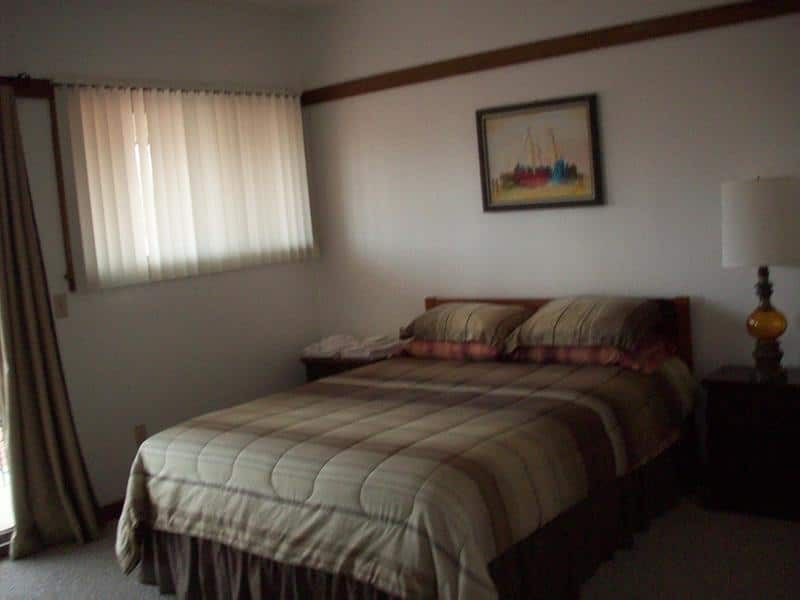 Two twin beds in a second bedroom. Sofa queen bed in the living room. 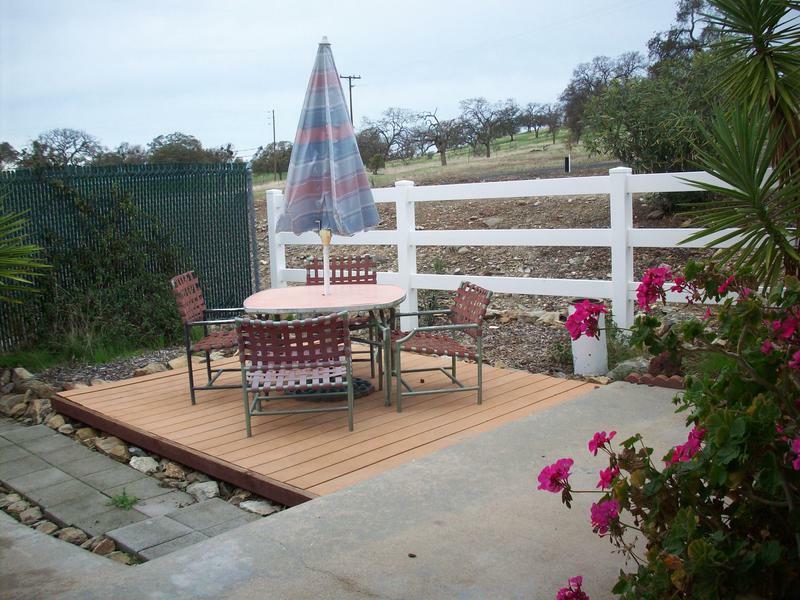 Private patio w/BBQ, umbrella table & chairs.